LUISS ENLABS, the startup accelerator based in Rome, launches for the first time a vertical acceleration program dedicated to high-growth digital startups operating within all the segments of the lifestyle chain, from fashion to luxury, and from food to solutions to improve working conditions and to make our living more enjoyable. The Lifestyle Acceleration Program will be based in Milan, one of the leading Italian cities in the lifestyle field, and is open to Italian and International digital startups working in the lifestyle market. The application for the Lifestyle Acceleration Program will be open till October 2nd. You can click here and fill the form to apply. Everything can be done online, but sometimes a face-to-face works best. 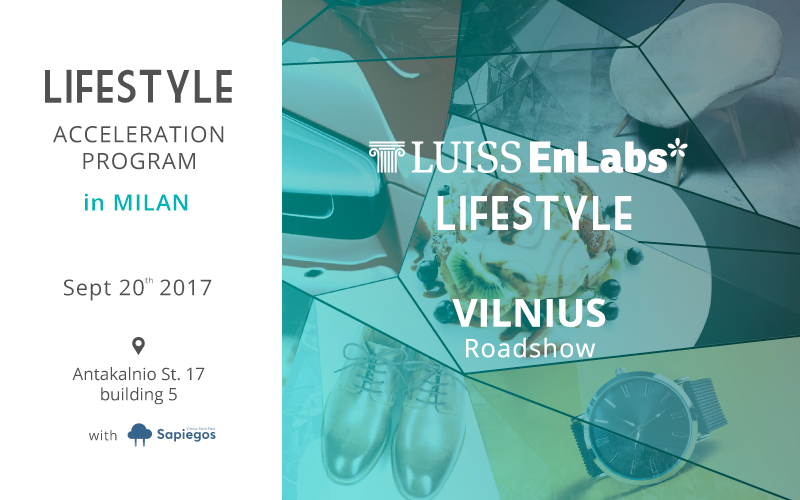 In order to meet us and present yourself, you can participate in one of the events of our Lifestyle Acceleration Program Roadshow. The next one will be in Vilnius on September 20th. 9.00 am - 5.00 pm Pitch panel: Pitch your Startup! 6.00 pm - The Italian ecosystem, an overview by Augusto Coppola 6.30 pm - Lifestyle Acceleration Program presentation 7.00 pm - The Lithuanian ecosystem, an overview by a successful entrepreneur 8.00 pm – Networking 9.00 pm – Closing [Register here to attend the presentation] During the Pitch Session, you will have the chance to book a slot to introduce yourself and pitch your startup to Augusto Coppola and get his feedback. More details on how to participate will be given at the beginning of the event. We do suggest you to prepare your pitch (max 5 mins) and participate in the session in order to increase the chances to be selected for Lifestyle Acceleration Program!